Not a good day for England cricket. AFTER succumbing to two Ashes whitewashes in under a decade, you'd think English fans had come to expect a Test cricket embarrassment every now and again. A 4-0 defeat to Australia over summer was enough to prove the Poms were struggling a bit with the longer format as they dropped to fifth in the ICC rankings. But nothing could prepare them for what was in store at Eden Park on Thursday. Shaping up against New Zealand for the first day of the inaugural day-night Test on Kiwi soil, the tourists found themselves in a spot of bother as veteran opener Alastair Cook fell to Trent Boult for five in the fifth over. What followed was an absolute bloodbath. Career-best figures for New Zealand’s demolition man. 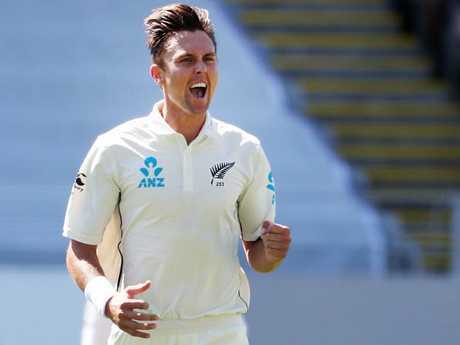 Boult tore through the English top order alongside long-time new ball partner Tim Southee to have the Poms at 9/27 by the 16th over. 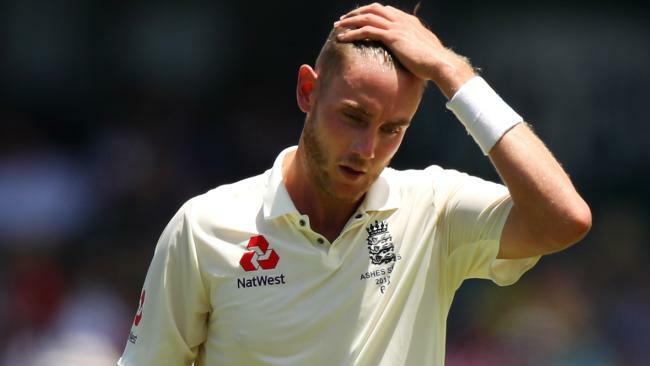 Returning all-rounder Ben Stokes fell victim for a duck, while skipper and renowned Test batsman Joe Root also fell for an egg. If England can take anything away from the disastrous performance, it's they avoided the most embarrassing record in cricket history: the lowest ever score of 26 made by New Zealand in 1955. Tailender Craig Overton began taking on the Kiwi attack by blasting the pink ball to and over the fence, eventually dragging the Poms over the half-century mark. Trent Boult finally wrapped up the final-wicket stand with the wicket of James Anderson in the 21st over. 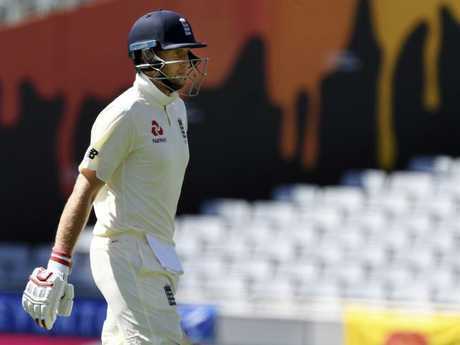 England's Joe Root leaves the pitch after being dismissed for 0. England was all out for 58. The Kiwi star Boult finished with career-best figures of 6-32, while Southee snagged 4-25. ENG 1/6 - Alastair Cook fell for five, edging a moving delivery after being drawn into a shot by Trent Boult. 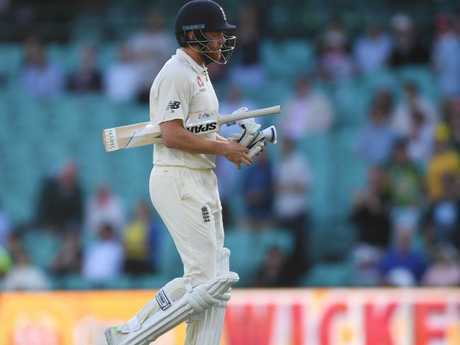 2/6 - Captain Joe Root arrived at the crease but lasted just six balls before playing on a drive off Boult onto his stumps and falling for a duck. 3/16 - Boult took his third wicket in the ninth over, dismissing Dawad Malan for two via caught behind. 4/18 - Tim Southee joined the fray with a full ball moving late and catching the edge of Mark Stoneman, sending the opener on his way for 11, the second highest score of the innings. 5/18 - Ben Stokes arrived at the crease with a point to prove but wasn't given an inch to ease back into white clothes cricket. He fell for a duck after Boult darted a ball back into his off stump and bowled him. 6/18 - Jonny Bairstow fell for a duck to Southee shortly after the Kiwi seamer took a caught-and-bowled off a poorly-timed drive. Jonny Bairstow got it horribly wrong. 7/23 - Boult took his fifth wicket in his seventh over with the scalp of Chris Woakes, bowling him clean with a swinging delivery for a duck. 8/23 - Moeen Ali couldn't handle the pace either, departing for zero after Southee crushed his castle with a yorker. 9/27 - The Kiwis were denied the delight of handing the Poms the lowest score in history as they passed 26, but a jaw-dropping catch from Kane Williamson more than made up for it. Stuart Broad departed for a duck after edging one to gully off Southee. 10/58 - A comparably heroic knock from Craig Overton saw the Poms pass the half-century mark before James Anderson fell to Boult via a catch at point. New Zealand passed the total for the loss of one wicket as Kane Williamson and Tom Latham went about building a sizeable first innings lead.